When installing SharePoint 2013 service pack 1 on a SharePoint farm, the extraction of the service pack kept failing on one web front end. When clicking on the officeserversp2013-kb2880552-fullfile-x64-en-us.exe file, the User Account Control dialog appeared, then when I continued to extract the files, the process failed with “The installation of this package failed”. Looking the service pack log file showed that some files were successfully extracted before the error. In order to work around the error on this server I found I needed to open an administrative command prompt and then run the service pack. This entry was posted in SharePoint and tagged SharePoint, SharePoint 2013 on November 5, 2018 by richardstk. Users reported that they couldn’t find a few specific documents when searching within SharePoint 2013. Checking the crawl log showed documents with the error “The item failed due to an error occurring when sending or receiving data to the external content processing enrichment web service.” I searched the ULS for one of the effected documents and found the error “System.Net.WebException: The remote server returned an error: (413) Request Entity Too Large.” Checking the web.config for the content enrichment web service showed the maxReceivedMessageSize value was configured to 8 MB. To resolve the error I increased the value of the maxReceivedMessageSize property and re-indexed the document library. The interesting thing about this case is that the content enrichment web service is designed to add additional metadata to documents. When the content enrichment web service failed to receive documents over 8 MB the documents didn’t appear within search at all, it wasn’t just the case that they appeared but without the extra metadata. This entry was posted in SharePoint and tagged SharePoint 2013, SharePoint Search on January 26, 2015 by richardstk. The item has been truncated in the index because it exceeds the maximum size. This item was partially parsed. The item has been truncated in the index because it exceeds the maximum size. This item was truncated because the parsed output was greater than the maximum number of allowed characters. Microsoft have detailed the SharePoint 2013 Search boundaries and limits here and I’ll show how these boundaries and limits relate to the warnings above. This message relates to the indexed managed property size and according to the aforementioned documentation “This is the default maximum size of a managed property that is set to either “searchable” or “queryable”.” The property limit can be configured between 0 and 2048KB. In order to change the limit open an elevated SharePoint 2013 Management Shell. To get the current property value run the code below. To change the property value run the code below, substituting the value for your own requirements. This message relates to the retrievable managed property size and according to the aforementioned documentation “This is the default maximum size of a retrievable managed property.” The property limit can be configured between 0 and 2048KB. This message relates to the parsed content size of the document. This has a boundary limit of 2 million characters that can’t be increased. Search stops parsing a document once the limit of 2 million characters has been reached and any content past this point isn’t included in the index. Once you’ve configured the indexed managed property and retrievable managed property sizes you need to run a full crawl. This entry was posted in SharePoint and tagged SharePoint 2013, SharePoint Search on December 18, 2014 by richardstk. The SharePoint Document ID Service is a Site Collection Feature which assigns unique IDs to documents within a Site Collection. The unique document ID can be used to locate documents within a Site Collection irrespective of their location. This is useful when documents may be moved around within a Site Collection due to work flows, or other processes. To search by document ID, open the Service Service Application through Central Administration, then open the search schema, which is under Queries and Results. Search for DocID in the managed properties box. The search results should return a managed property with the name DocID and the Query property should be enabled. The property should be mapped to the crawled property ows_dlc_DocId. The Query property enables the ability to search specifically by the property. Open your search center and in the search box enter DocID:%DOCID% where you replace %DOCID% with the document ID for which you wish to search. This entry was posted in SharePoint and tagged SharePoint 2013, SharePoint Search on December 12, 2014 by richardstk. By default, SharePoint 2013 Search shows 5 options for each refiner, except result type, which has 6 options. 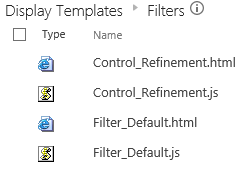 In order to change the number of options you need to edit the Filter_Default.html display template. Do to this open Site settings, then Master pages and page layouts. Drill through to Display Templates -> Filters. Download a copy of Filter_Default.html. Open Filter_Default.html in a text editor and find the two values below. Change the values for shortListSize as required and save the file. Upload the file to the document library where you downloaded the copy and overwrite the existing file. Refresh the search page to see the change. This entry was posted in SharePoint and tagged SharePoint 2013, SharePoint Search on November 24, 2014 by richardstk. To look for the missing file I went to Site Settings, then Master page and page layouts, which is under the heading Web Designer Galleries. On that page I navigated through Display Templates -> Language Files. I could see that for some reason the en-GB folder was missing. The fact that the folder was missing was odd because I’d used the Content Search Web Part before within the Site Collection. Anyway, to resolve the error I created the en-gb folder and copied customstrings.js from the en-us folder and pasted it into en-gb. This entry was posted in SharePoint and tagged SharePoint, SharePoint 2013, SharePoint Search on November 18, 2014 by richardstk. In SharePoint 2010 it was easy to switch between languages using the user menu within SharePoint. 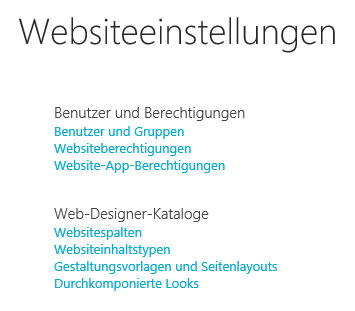 To switch language In SharePoint 2013 open Control Panel -> Language and click Add a language. 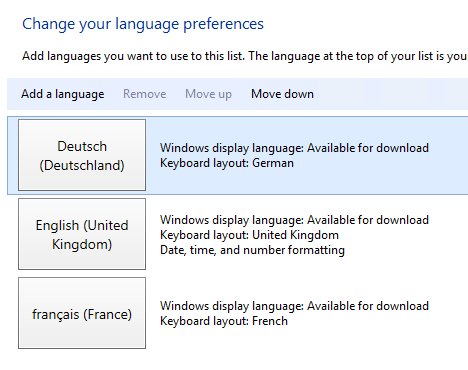 Once you’ve added the required languages switch between them by moving the language you want to use to the top of the list. Close and re-open your browser for the change to be recognised. This entry was posted in SharePoint and tagged Microsoft SharePoint, SharePoint, SharePoint 2013 on October 31, 2014 by richardstk.